Tirukalukundram is known for the Vedagiriswarar temple complex, popularly known as Kazhugu koil (Eagle temple). This temple consists of two structures, one at the foot-hill and the other at the top-hill. The annexure to the temple is called the Bakthavatchalaeswarar Temple. 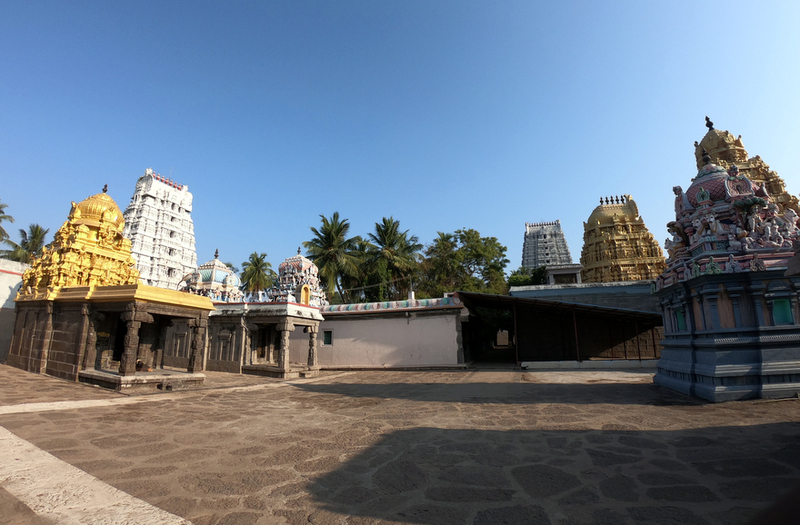 Situated in an area of ten acres, this temple is surrounded by many Theerthams. Four colossal gopurams adorn this temple, which closely resembling the architecture of the Annamalaiyar Temple at Tiruvannamalai. The word Thirukazhukundram comes from the Tamil words Thiru (Respectful), Kazhugu (Vulture/Eagle), Kundram (mount). It was known as “Thirukazhugukundram” in ancient times, which, overtime became Thirukazhukundram. 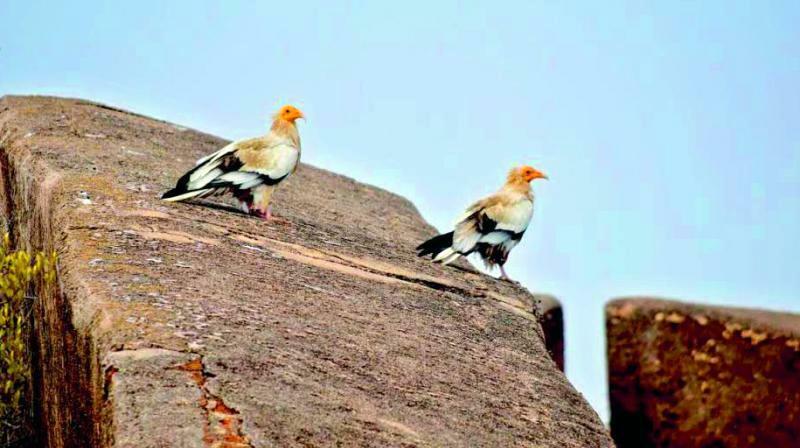 The town is also known as Pakshi Theertham (Bird’s Holy Lake) because of a pair of birds -Most likely Egyptian vultures that are believed to have visited the site for centuries. These birds are traditionally fed by the temple priests and arrive before noon to feed on offerings made from rice, wheat, ghee and sugar. Although punctual, the failure of the birds to turn up was attributed to the presence of “sinners” among the onlookers. It has also been known as Uruthrakodi, Nandipuri, Indrapuri, Narayanapuri, Brahmapuri, Dinakarapuri, Muniganapuri in the past. There are many inscriptions in the temple. It is also called Pakshitirtham. According to legend, Sage Bharadwaja prayed to the god Shiva for a long life so he could learn all the Vedas. Shiva appeared before him and granted him the wish to learn the Vedas and created three mountains each signifying a Veda (Rig, Yajur and Sama). Shiva took a handful of mud and said “Dear Bharadwaja! The Vedas that you could learn are only this handful compared to the mountains present here, even if you live much longer and hence, learning is never ending and could possibly cannot be the route for Salvation”. Shiva also said that in Kaliyuga, the simplest and the surest way to salvation is Bhakti or unfettered devotion, service and love of God and his creations. 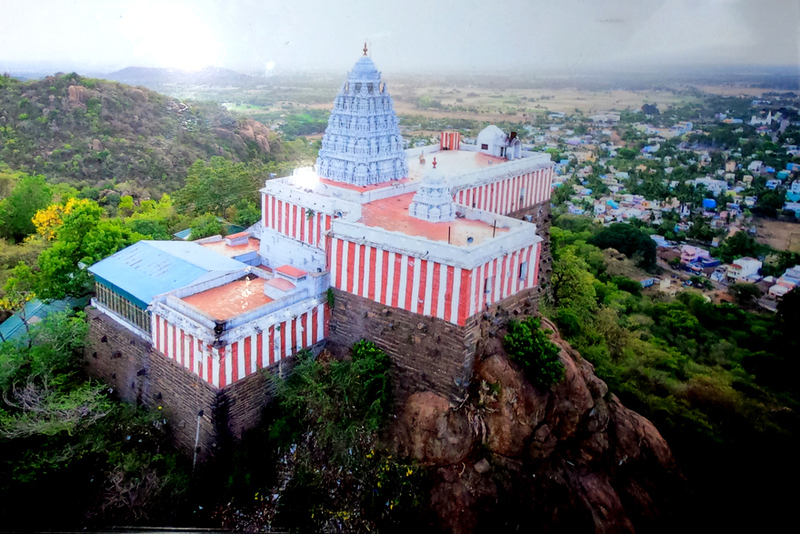 It is believed that the hill on which the Vedagiriswarar temple is built, is the mountains signifying the Vedas created by Shiva himself. The name Vedagiriswarar means “the Lord of the Vedic Mountains” in Sanskrit. The hill covering an area of 265 acres is 500 feet high and the hilltop can be reached by ascending 562 well-laid stone slabs. On the way there are small mandapams, for pilgrims to rest. The steps and the walls on the sides have been built from donations. Before ascending the steps, the devotees worship Siddharti Vinayaka and Ayyappa at the foot of the hill. The main attraction, the large temple hill-top temple houses the deity of Shiva, known as Vedagiriswarar. 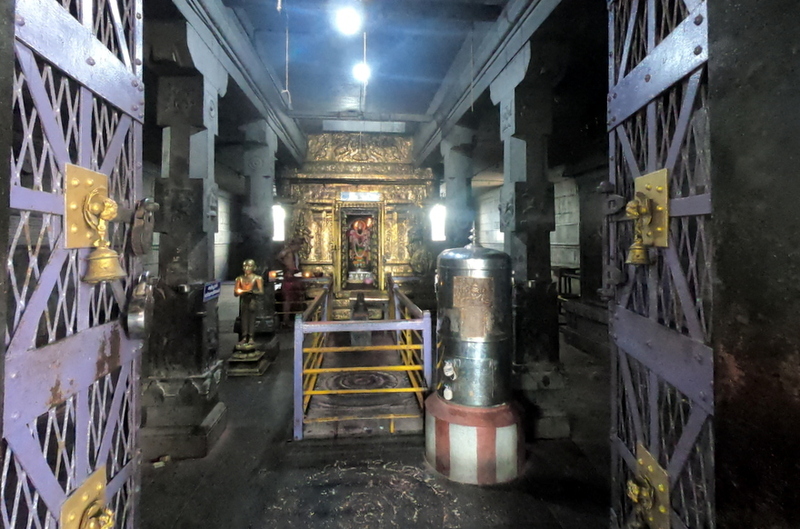 The central shrine of the temple where the presiding deity Vedagiriswarar is seen is built of three large boulders, constituting the three walls for the sanctum. Vedagiriswarar is a swayambu lingam. Vedagiriswarar was worshipped by Indra, Thillothama (a dancer in Indra’s court), Garuda (mount of Vishnu), Ashtavasus and many Rudras. The four Nayanmars, Appar, Sundarar, Manickavasagar and Thirugnanasamandhar visited the temple complex and composed hymns in praise of Vedagiriswarar. 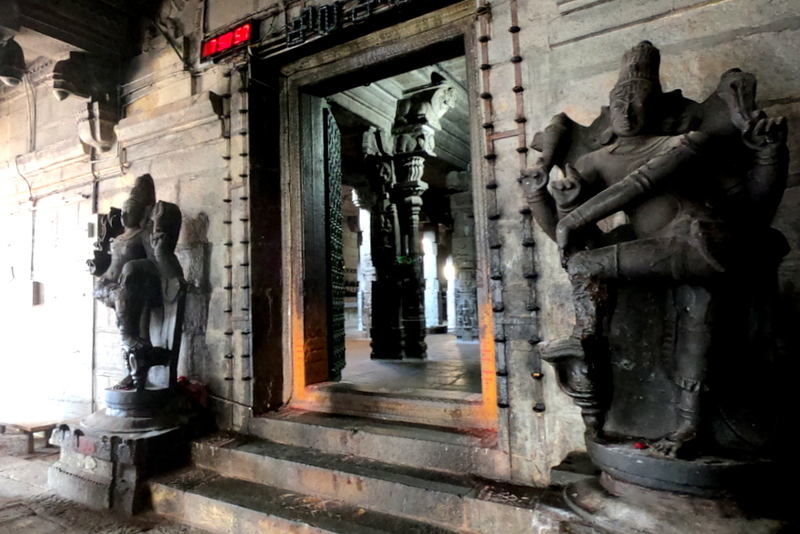 The inner walls of the sanctum contain many images, all hewn out of the rock surrounding the presiding deity. 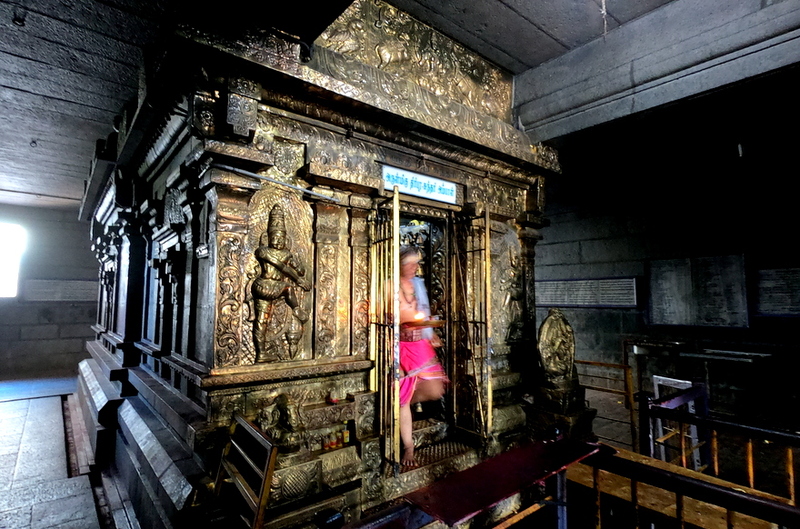 In the enclosure around the sanctum, are the shrines of Goddess Sokkanayaki and Vinayaka (in a dancing pose). After a darshan of Vedagiriswarar, devotees used to eagerly await the arrival of the eagles just before noon. After cleaning a particular spot on the adjacent boulder, the temple priest sits down, with the food (sakkarai pongal). Two eagles, after circling around temple top,used to come near the priest walking. They eat the balls of rice and after cleaning their beaks in the water kept in a small vessel nearby, take off, circle around the tower again and fly off. The scene is sculpted on one of the walls in front of Goddess Tirupurasundari, in the lower temple. Many tales are told about the visit of the two eagles. Two rishis (sages) — Pusha and Vidhadha were cursed by Lord Siva to become eagles, for some indiscretion. It is believed that these are the two eagles that visit Thirukazhukundram daily for time immemorial, in order to worship Siva and to obtain salvation from His curse. It is said that after a bath in the Ganges in the morning, they come here at noon for food, reach Rameswaram in the evening for darshan and return to Chidambaram for the night. Since 1998, the Egyptians Vultures have stopped showing up at Vedagiriswarar Temple. It may be because there are too many sinners flocking in the area. Or it may be that the last pair of Ashthavasus has finally attained moksha. In this Connection, an incident reported about in almost all the news paper of madras may be mentioned. On June 17,1921 at about 9A.M,Two white eagles were observed at the Madura temple. They were immediatly photographed,and the photograph was sent to the trustee of the temple of Thirukazhukundram, with the following letter from the Reciver of the Madura Temple. 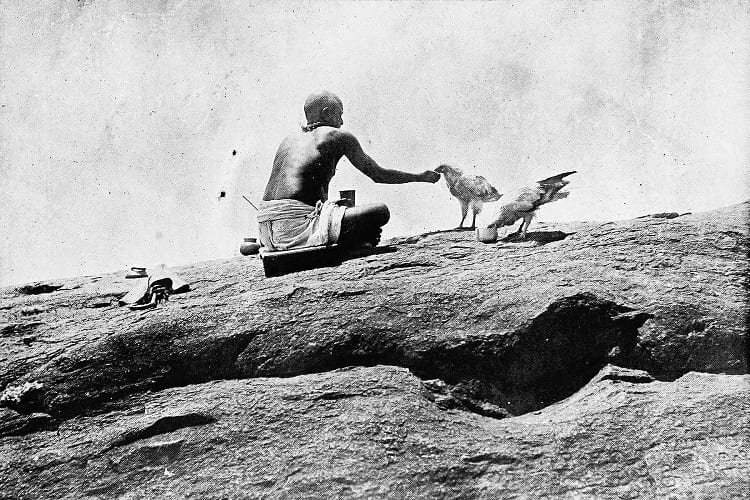 The Truste of the Thirukazhukundram Temple replied that he, as well as a number of other gentle man to whom he showed the photograph, could at once identify the birds in the photograph as being the sacred eagles of Thirukazhukundram. After descending a few steps on the other side, a monolithic cave-temple is seen. This mandapam is full of rare sculptures and belongs to the Mamalla period (A.D. 610-640). There are two verandahs in the cave, each being supported by four massive pillars. 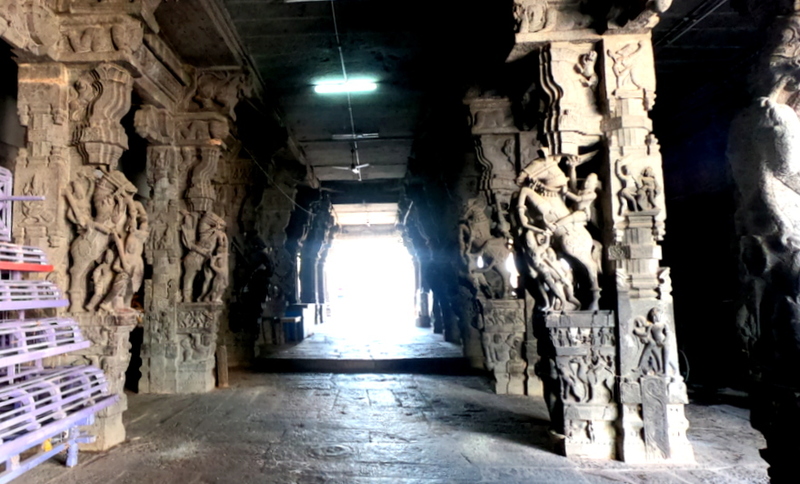 The peculiarity is that the whole mandapam with sculptures is hewn out of a single rock. 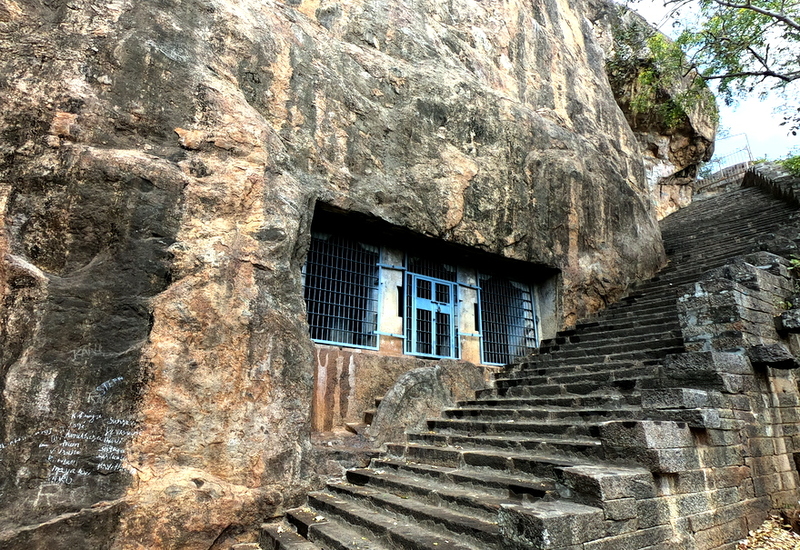 Hence this cave is known as Orukkal Mandapam. On the eastern side, at the foot of the hill, there is a small shrine Nalvar Koil, from where the four Tamil saints — Appar, Sundarar, Sambandar and Manickavasagar — had darshan of Vedagiriswarar. The Consort of Vedagiriswarar is not seen on the hilltop. She is enshrined in the temple of Bakthavatsaleswarar at the centre of the town. The temple has four gopurams (towers), the tallest with nine tiers (on the southern side) and the other three with seven tiers. The absence of a Nandi before the presiding deity on the hilltop is a unique feature. The Nandi once undertook penance on the Earth. Pleased, Siva appeared before him and told him to ask for a boon. The Nandi desired that the place and the tank be named after him and asked that those taking a dip in the tank and worshipping Vedagiriswarar be absolved of their sins. His prayer was granted and hence the place is also known as Nandipuram and the tank, Nandi Thirtham. The mahamandapam that fringes the inner gopuram (Rishi Gopuram) contains a fine sculptural representation of Agora Veerabhadra (Siva in ferocious form), a colossal figure seven feet high. A similar image can be seen at the Meenakshi temple in Madurai. The prakaram around the sanctum of Bakthavatsaleswarar (the presiding deity of the temple) has many images. The shape of the vimanam of the temple is peculiar, resembling the Buddhist viharas in the North, since the spherical top portion is cut in front. It was here that Lord Siva appeared before the Tamil saint Manickavasagar, in the form of Dakshinamurthi, and initiated him into the secrets of the holy Panchaksharam. The plantain tree is the sthala vriksham of the temple. Goddess Tirupurasundari has a special shrine. Around the sanctum engraved on marble slabs fixed on the walls, are verses from the “Abhirami Andhathi. There are 12 Theerthams (holy water tanks) around the hillock namely, Indra Theertham, Sambu Theertham, Rudra Theertham, Vashishta Theertham, Meygyana Theertham, Agasthiya Theertham, Markandeya Theertham or Sangu Theertham, Kaushika Theertham, Nandi Theertham, Varuna theertham, Agalikai Theertham, Pakshi Theertham. Of the above 12 theethams, Sangu theertham is the most renowned holy tank. It is an extensive tank of 1,000 square yards area, with wide steps on all sides. It is believed that Saint Markandeya, came down here after visiting Benares. 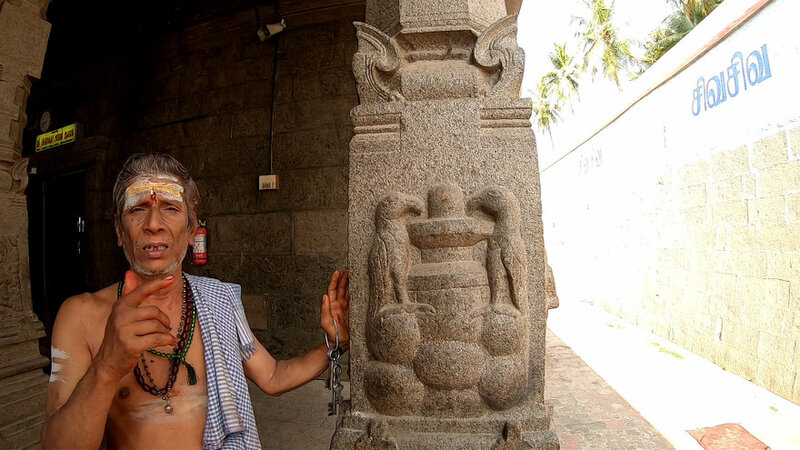 He wished to have a bath in the sacred tank and perform abhishekam to the Siva lingam here but he found no vessel to take the water. Just then a conch suddenly emerged from the tank, with a humming sound, and Markandeya performed the abhishekam. 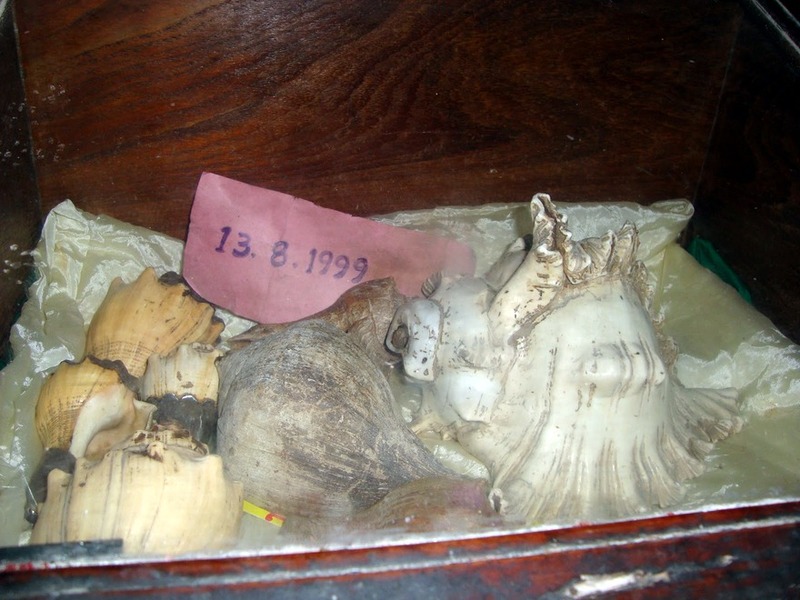 It is said that even now once in 12 years, a conch emerges from this water, which the temple authorities collect with all honours and preserve in the temple in an enclosed glass box with dates mentioned therein. It is astonishing that a conch gets formed in fresh water since the natural phenomenon of a birth of a conch can happen only in salt water. 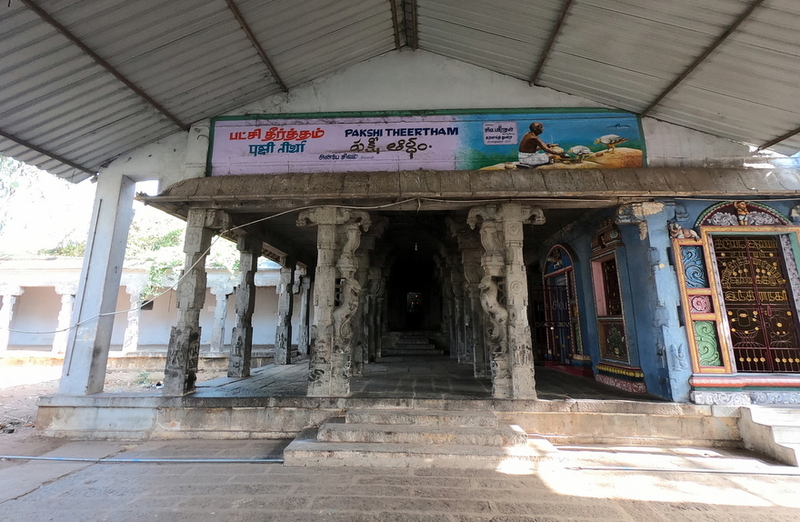 There is a collection of about 1,000 conches in this temple, with which, abhishekam is performed to Lord Vedagiriswarar on the last Monday in the Tamil month of Karthigai. 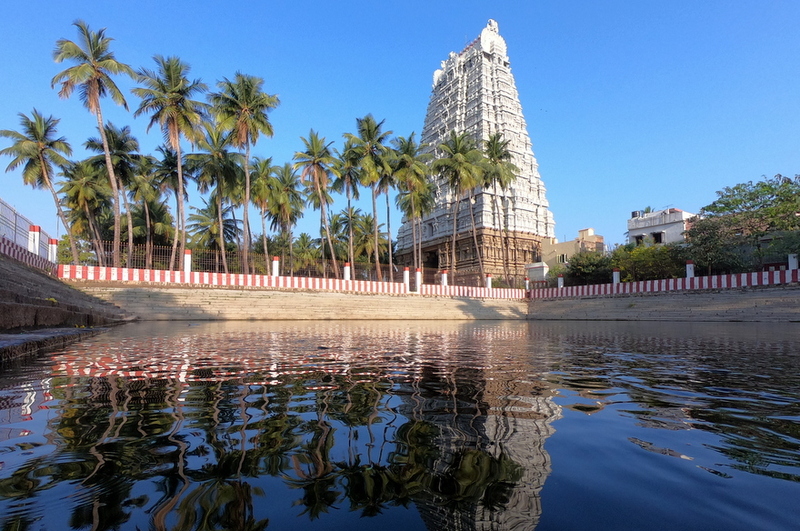 According to the sthalapuranam, Lord Siva Himself has declared that this tank is the holiest of all, and as per His command, all the sacred waters in India meet here once in 12 years when Guru (Jupiter) enters Kanya rasi. 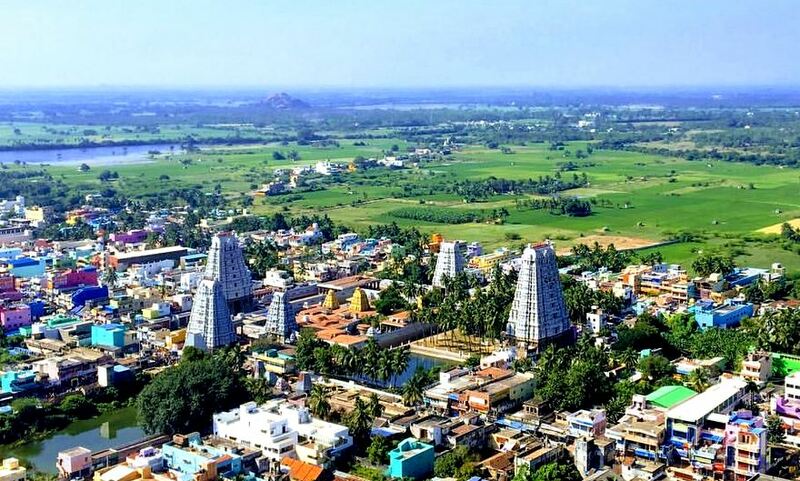 The event is conducted as a festival — Sangu Thirtha Pushkara Mela — when there is a huge gathering from all parts of the country — this being the second biggest bathing festival in the South, next to the Maha Makham. Majority of the devotees throng the temple for mental peace and salvation. Those mentally retarded come and stay here for 48 days, bathe in the Sangu Theertham, pray to Lord Veda Giriswarar and return fully cured. This miracle is happening even now. Diseases of any intense nature as Asthma, blood pressure and heart are cured by prayers to Lord. They breathe the air with herbal effects and get cured. Devotees also come here seeking wedding, child boons too. Ten acre temple at the foot hill houses to amazing architecture and art. Approximately, 500 years back Lord Sri Chaitanya Mahaprabhu visted this temple which is recorded in Sri Caitanya-Caritamrta Madhya-lila 9.72 as below. 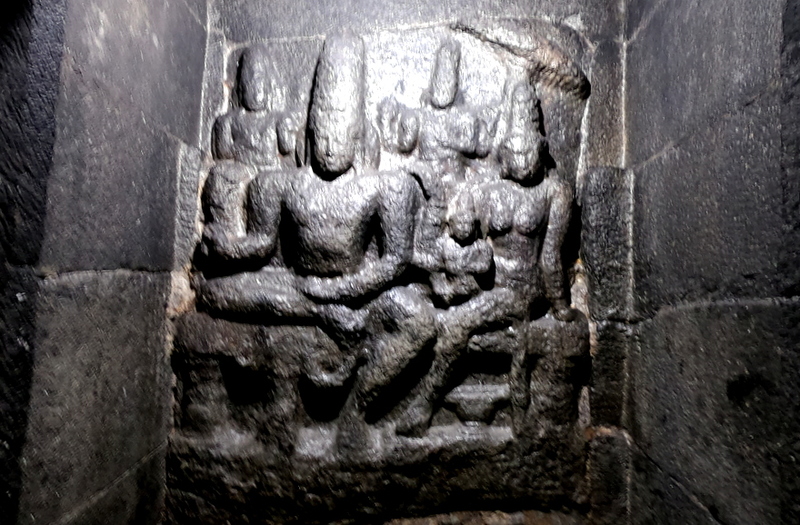 pakṣi-tīrtha dekhi’-after visiting the place known as Pakṣi-tīrtha; kaila—did; śiva daraśana— darshan of Lord Shiva. There is 10 day Chithirai festival happens in the temple drawing huge devotee crowd in April-May. 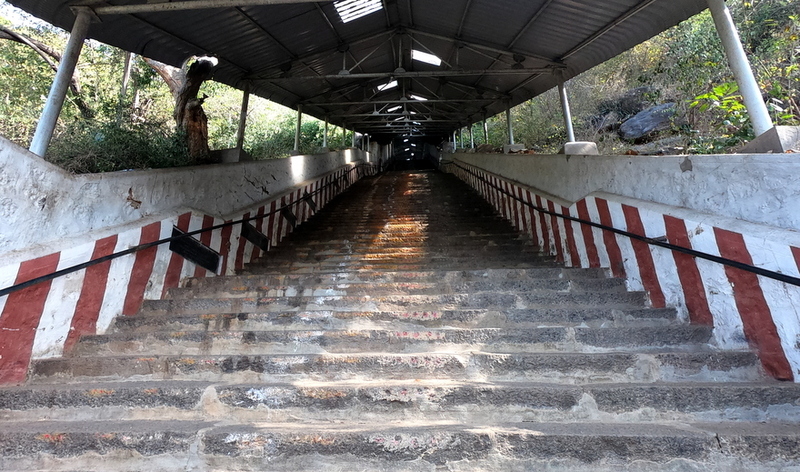 Next to Thiruvannamalai, Girivalam is observed by devotees here too on full moon days. Lakhs of people join the event. 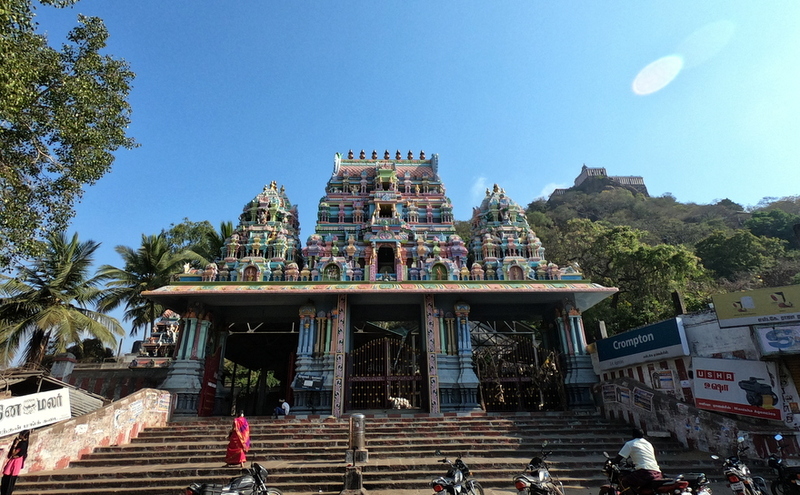 It is said that the Girivalam practice was in vogue in this temple even before it began in Thiruvannamalai.